Just Eat, the online take-away ordering service, have issued a warning over scam survey emails that are tricking some customers into giving away personal data to fraudsters. 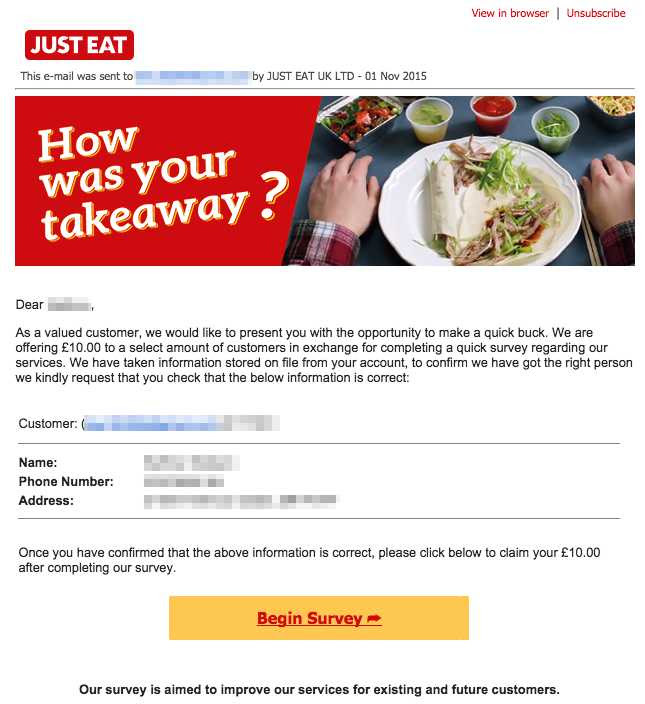 The emails, like the one pictured, claim that some Just Eat customers have been selected to receive a £10 reward for completing an online survey. They ask the recipient to confirm their details and click a button to start the survey. The emails are a scam - there is no survey, and clicking the link will take you to a phishing website, or at the very least confirm to scammers that they have acquired genuine personal data. We will never ask you to enter your JUST EAT account details or any personal information via email. And we don't store payment information or card details anywhere in our systems. Some customers are receiving particularly sophisticated scam emails. These emails look like they come from JUST EAT and ask you to enter personal and JUST EAT account details. If you receive one of these emails, delete it and do not click the link.